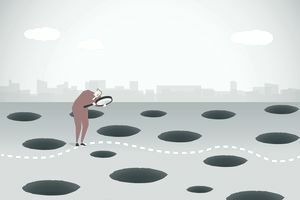 In your quest to gain financial independence and wisdom, you'll likely encounter the term "value trap" to describe certain stocks, industries, or situations. What is a value trap? How can you spot one? How can you defend yourself against it or avoid it altogether? What causes it to develop? These are all great questions! In this article I'll walk you through them step-by-step so you have a basic understanding of why the concept of value traps is important. Being aware of their existence can help you better manage your portfolio risk, avoiding situations that might otherwise tempt you to do something foolish. What Is a Value Trap? In the world of money management, the term "value trap" refers to a situation that, on the surface, appears to offer an investor the opportunity to acquire significant assets and/or earnings relative to market price, promising a chance at much higher-than-average profits than the broader stock market, but it turns out to be illusionary due to any number of factors. What Causes a Value Trap to Develop? A Permanent Change in the Cash Generating Power of a Firm or Industry That Makes Past Comparisons of Little Use - Think about horse and buggy manufacturers after Henry Ford began production on the Model T automobile. Their days were numbered; their product lines doomed for a cyclical decline as families traded in their stables for garages, giving up hay and oats for gasoline. If you saw the price decline, looked at the past net income, and thought, "Oh boy, this is cheap compared to fundamentals! ", you were very mistaken. The past operating results of the business were of limited use in determining its intrinsic value. A So-Called Peak Earnings Trap in Cyclical Industries - There is a phenomenon known as a "peak earnings trap" that can do a lot of financial damage to inexperienced investors. It occurs when men and women buy shares of companies in cyclical industries that experience booms and busts - think homebuilders, chemicals, mining, refining - toward the top of an earnings cycle; when conditions are better than they have been in years, decades even, so cash is flooding into the income statement and balance sheet of the firms in which they've acquired ownership. This causes the price-to-earnings ratio to appear significantly undervalued. Paradoxically, many cyclical enterprises are actually most expensive when their p/e ratio appears low and cheapest when their p/e ratio appears high. In such situations, you're better off looking at the PEG ratio or dividend-adjusted PEG ratio. Cash Flow Issues Are More Severe Than the Income Statement Alone Indicates - If you've ever taken a college-level accounting course, you might have studied famous examples of profitable businesses that were generating good earnings at the time they went bankrupt. This can happen for a variety of reasons. In the 2008-2009 Great Recession, several lucrative financial institutions, including a handful of the world's major investment banks, had their common stockholders wiped out because the business funded long-term liabilities with current assets; a mistake in capital structure that spells certain economic death when the world falls apart but one that is repeated every generation as the lessons of the past are forgotten. In other cases, retail stores had what is known as high operating leverage; fixed cost structures that meant a never-ending sea of losses if sales fell below a certain threshold, with nearly everything above this amount falling to the bottom line as profit. For example, if analysts expect sales to decline below this threshold for some reason or another, a 20% decline in revenue can translate into an 80% decline in profits. In still other situations, a firm might be doing fine but capital market conditions are difficult or a huge corporate bond issue is coming up for maturity and there is doubt about the firm's ability to refinance. Alternatively, the business is going to have to pay significantly higher interest expense, reducing profits in future periods due to an increase in the cost of capital. Perhaps a major competitor has entered the scene and is gobbling up market share, taking away key clients, and has manufacturing or service delivery efficiencies that puts the business at a severe competitive disadvantage, in which case, the apparently low stock price isn't really low at all as the earnings per share will catch up in time, falling to an appropriate level relative to stock market price. For most investors, the answer to avoiding value traps is avoiding individual stocks entirely as they lack the financial, accounting, and managerial skills required to evaluate specific firms; to buy index funds, instead, regularly dollar cost averaging into them, preferably within the confines of a tax shelter such as a Roth IRA. Otherwise, the answer can be found by attempting to discover the reasons - the why - other owners have been dumping their equity. Uncover the bad news; the expectations that are causing everyone to become disgruntled with the business. Then, try and figure out whether 1.) you think their negative expectations are likely to come to pass, 2.) whether they are over- or underestimated, and 3.) to what degree. In rare circumstances, you'll come upon a gem. You'll find a wonderful business that is being practically given away for free. One classic example of doing your homework to find that what appears to be a value trap is not, in fact, a value trap is the American Express salad oil scandal of the 1960's. A young Warren Buffett made a lot of money - money that went on to serve as the basis of his Berkshire Hathaway fortune - by calculating the maximum potential damage the credit card company would face if everything possible went wrong, realizing investors had become too pessimistic. The business would be fine. More recently, a lot of disciplined investors were buying shares of high-quality, financially strong blue chip stocks during the 2008-2009 meltdown when they discovered that other investors were selling not because they wanted to part with their ownership, but because they were facing liquidity crunches and needed to raise whatever cash they could to pay their bills! Coffee giant Starbucks is a fantastic case study. Prior to the meltdown, the enterprise had a rock-solid balance sheet and after-tax profits that were exploding. When the economic storm clouds appeared, families were suddenly losing their houses, investment banks began imploding, and the Dow Jones Industrial Average started collapsing, this incredibly lucrative business, pumping out huge amounts of profit and cash flow, declined from a high of $20.00 per share in 2006 to a low of $3.50 in 2008; a figure that represented less than 8x earnings on its prior-year figures and a 12.5% after-tax earnings yield. This is a company that had so much expansion room left, it had been growing at 20%+ without dilutive equity infusions for decades; with an entire world left to conquer as it expands into China and India. It was a once-in-a-lifetime opportunity to become an owner in the premier coffee vendor on the planet. Those who took advantage of it not only collected cash dividends in the years since, but have watched the stock climb back to $50+ per share. With a current dividend rate of $1 per share (as of September, 2017) following the board of director's decision to send more money to owners, that means someone, somewhere out there very well could be collecting an 18%+ cash dividend yield on cost for the shares bought at the absolute bottom (remember - there has to be a buyer and seller in every transaction; it's the nature of an auction).